Companies should consider managed file transfer (MFT) suite vendors that meet short-term tactical and long-term strategic needs. It's all too easy to react too quickly and procure and deploy technology that supports only one protocol or security standard. It's much more prudent to deploy a product that can be easily expanded and upgraded to handle multiple protocols and multiple standards in a governed way that is fully auditable. As an increasing amount of technology providers augment and enhance their products, marketing and messaging to suit the explosion of interest in the MFT solutions market, Gartner has steadily increased the amount of vendors we track in this particular research agenda. 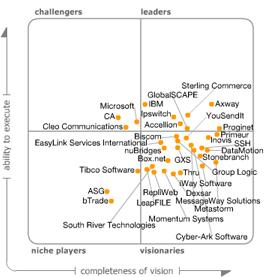 Today, Gartner actively tracks more than 45 vendors in this market segment. These vendors deliver solutions using a wide range of deployment options, including the use of the cloud services, appliances, virtualization and stand-alone software. Additionally, some of these vendors focus exclusively on traditional system-to-system file-based integration (internal and external) or the emerging people-to-people file-based integration facilitated by sending files via e-mail, using shared folders or very basic FTP server applications (governing collaborative and productivity suites). Gartner recommends that companies seeking MFT technologies look beyond vendors specializing in one or the other, and include the vendors that have done a credible job of integrating both disciplines. In some cases, this functionality will be delivered via a partnership reseller or OEM, while in other cases (such as with acquisitions), integration has happened and will continue to happen. In fact, many enterprise knowledge workers have been dealing with issues around the movement of their large files for quite some time. Sometimes users will get a message from the e-mail administrator letting them know that their file is too big to be sent, or that the recipient's e-mail system will not allow certain files or file sizes. Knowledge workers are then faced with the daunting task of getting the e-mail administrators to change their settings (not likely) or turning to third-party technologies and ad hoc processes to facilitate collaboration. These third-party technologies may come in the form of cloud services, online storage, personal e-mail accounts with vendors that allow larger files to be sent (Google Gmail, Microsoft Live and Yahoo Mail), or physical media, such as burning a DVD or using a Universal Serial Bus (USB) memory device. Regardless of the mechanism and process the knowledge worker uses, it is a good bet that most companies do not have the governance processes and mechanisms for enforcement of those processes and policies in place, with regards to how knowledge workers collaborate. As a result of this activity, some MFT vendors have been looking at ways to include extending their governance technologies into the collaborative activities mentioned above and more-formalized collaborative and content management suites. As with any market with growing visibility, Gartner has seen the entrance of major infrastructure vendors, such as IBM and Microsoft. Software AG and Attachmate (not yet included in this Magic Quadrant) are poised to offer solutions based on the pieces of the Proginet portfolio to their installed bases, thus strengthening their strategy of MFT being an integral part of any integration initiative. Other vendors, such as Box.net, DataMotion, Dexsar, Inovis, LeapFILE, Thru and YouSendIt, have adopted a cloud-service approach, which will initially attract companies looking to better govern the collaborative activity of their knowledge workers. While the value proposition of cloud-based MFT is strong and the focus on the business user is strong, there continues to be difficulty in attracting IT organizations and using the technology for more-traditional MFT activity, such as mainframe to a distributed network or internal hub to external spoke MFT. These solutions do have on-premises elements, such as lightweight adapters and proxies, used in conjunction with applications like e-mail that can help these service providers articulate the value of hosted MFT to enterprise IT stakeholders. The continued dominance of Axway and, to a lesser extent, Sterling Commerce: These two vendors continue to effectively sell complete MFT suites and services at a higher price (more than $500,000) than other vendors, and often to high-level IT executives, by predicting return on investment and demonstrating the value of MFT as an essential part of a company's enterprise nervous system. Not surprisingly, these vendors are front and center in discussions about the next phenomenon in the MFT market: private cloud enablement. The emergence of Proginet as a leader that is actively changing the landscape of the MFT space by enabling key infrastructure players, such as Software AG, Attachmate, Inovis and Beta Systems, to compete against other MFT vendors. All aspects of Proginet's portfolio have been or will be leveraged in partnerships, reseller agreements and OEM agreements. It is safe to assume that the Proginet business model is enabling third-party infrastructure vendors (such as service-oriented architecture [SOA] backbone, data integration and B2B gateway vendors) to offer clients robust MFT capabilities. Even in the event of an acquisition, the Proginet technology will remain valuable and the acquirer is likely to have a significant influence in the MFT space. IBM's entry into the MFT space has been a long time coming (IBM's current and former MFT partnerships have been very lucrative, including two of the visionaries in this market, Metastorm and Primeur). Surprisingly, however, there is little immediate recognition of IBM's technology, based on WebSphere, as a valid and worthwhile solution for many companies' MFT needs; we continue to see IBM's MFT technology in MFT replacement deals. That said, IBM is playing "catch up" with the established leaders in this market. Accellion's and Ipswich's ability to execute has excelled in the latter half of 2008 and the first half of 2009. Accellion, known for e-mail offloading, has leveraged its success with ad hoc file transfer and relationships with IT executives, and is currently offering a combination of appliance technology and virtualized technology (both deployed on-premises), and a cloud-based solution that allows companies to govern and move responsibility for file transfers transparently. Given its credibility at the senior IT level, Accellion has become a trusted advisor to its clients with regards to MFT, allowing it to bypass RFPs and proof-of-concept trials. Ipswitch has fully integrated its 2008 acquisition of Standard Networks, while becoming a fixture on RFPs not just in its target market ($15,000 to $75,000), but also for companies deploying MFT in a utility model. This is a far cry from two years ago, when Ipswitch struggled to be perceived as offering more than downloadable, consumer-focused technology. Vendors such as Biscom, Cyber-Ark Software, DataMotion, Group Logic, iWay Software, Metastorm, SSH and Stonebranch are better-known for other elements of their portfolios. They have come to realize that there is a substantial opportunity in the MFT market. Each of these vendors has committed resources to marketing and messaging MFT technologies, along with the other parts of their portfolios and the integration of those technologies, to the larger MFT market. Vendors such as Aspera, Comcast Media Center, Saavis and Signiant are dominating industry-specific markets with MFT suites that squarely focus on value-added file services, such as high-speed delivery, data loss prevention, digital asset management and partner provisioning. Rather than marketing and selling a horizontal product in the MFT space, these vendors have chosen to sell value-added file services and to view MFT as an enabler of those services. All these vendors compete at various levels in the entertainment and media vertical, but boast a slew of customers and other verticals, thus full inclusion in the MFT market is inevitable. Given this circumstance, vendors in the MFT market should continue to closely monitor the vendors noted above because they have successfully demonstrated how to effectively develop, market and sell value-added file services to the enterprise.